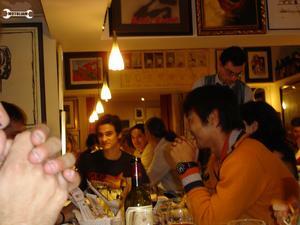 That night Hiro had invited me to his birthday party at a chic Italian Restaurant. It was a small group, about twelve of us. OhTanjoobi Ohmedetooo! Half of the group was Hiro's friends, the other half belonged to this guy. Who's that?!? 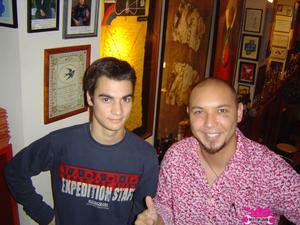 None other than 3X World Champion Dani Pedrosa! I believe this kid is the future of MotoGP. I have watched him carefully and he has the touch. Hopefully he has the muscle to throw the big bike around. Later, I'm shooting his first ride on the Repsol "B" Bike. . . although I'm sure it will be the equal or better of the "A" Bike. We went out and five of us lasted until 5AM!! I walked Hiro and his friend Ursula home since we live about ten minutes walk from one another. 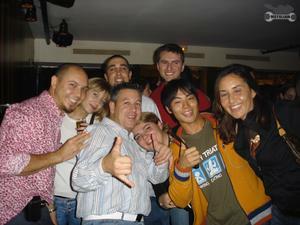 Tipsy Japanese guys are funny! Please note: Teh Shocker is alive and well in Barcelona!